I haz a happy now. This iz such an awesome story.... they iz all welcome to the internets army! Even the bear! Hazah! The trio was originally owned by a drug dealer who didn't properly care for them, leading to neglect, poor health and severe injuries. 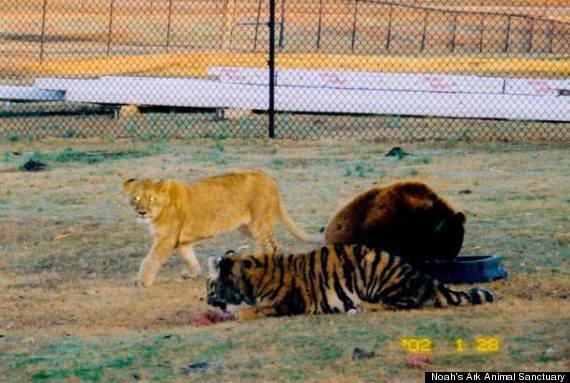 In 2001, Noah's Ark Animal Sanctuary, a nonprofit that cares for animals in need, came to the rescue, and took them to Locust Grove, Georgia, where they were treated for injuries. 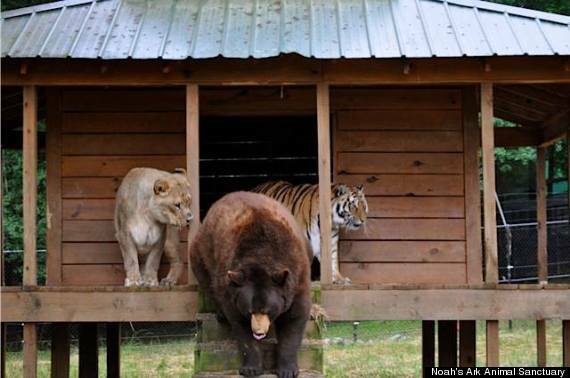 "We could have separated them," Diane Smith, assistant director of the Noah's Ark Zoo told the Telegraph. 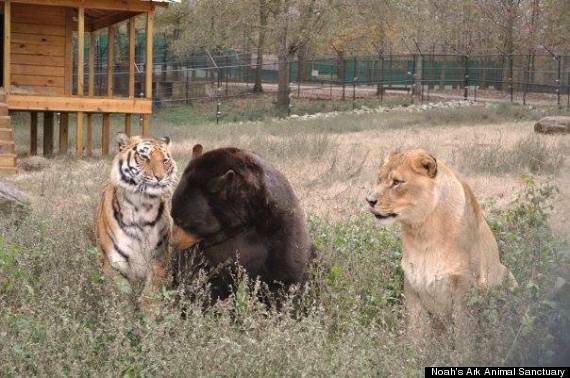 "But since they came as a kind of family, the zoo decided to keep them together." 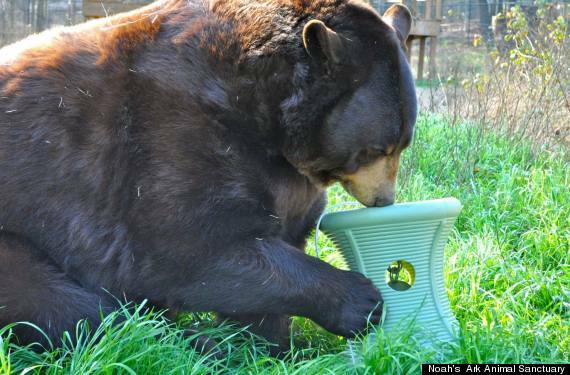 Baloo required greater care than his two friends -- his former owner had put a harness on him and didn't adjust it as he grew, leading to a deformity, Imgur reports. After arriving in Georgia, Baloo had the harness surgically removed. Given that the trio had found comfort in each other during their years of mistreatment, The Sanctuary's staff realized that they couldn't be separated and fenced them in together. 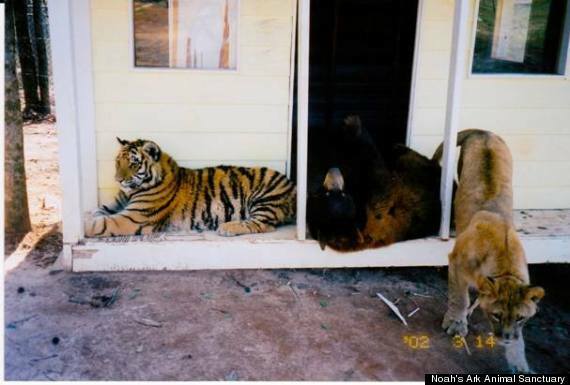 Unfortunately, the government passed new federal regulations requiring big cat enclosures to have 16 foot fences put up, which would take effect in October of this year. 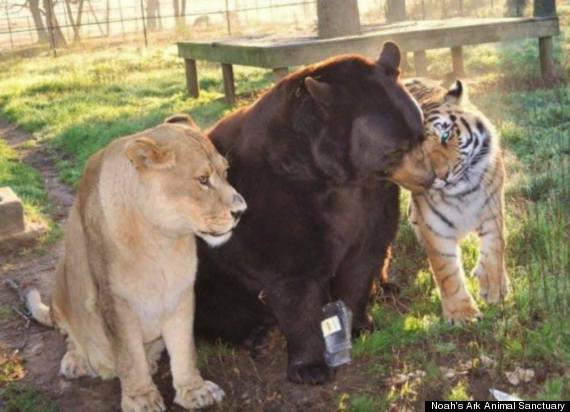 Baloo, Leo and Shere Khan's fence was only 8 feet high. 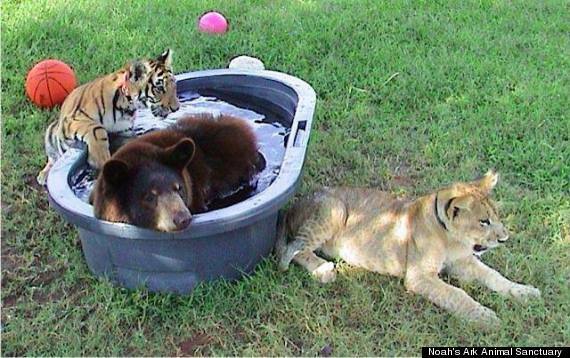 If these regulations weren't met, the three animals would have to split up. Rebuilding the fence would cost $489,000. With October slowly approaching, The Sanctuary entered a contest to help raise money. On August 15, CrowdRise, an online fundraising site, teamed up with RYOT, a social news platform to announce a challenge called #STARTARYOT, according toncronline.com. They offered $75,000 to the nonprofit that raised the most money in five weeks. 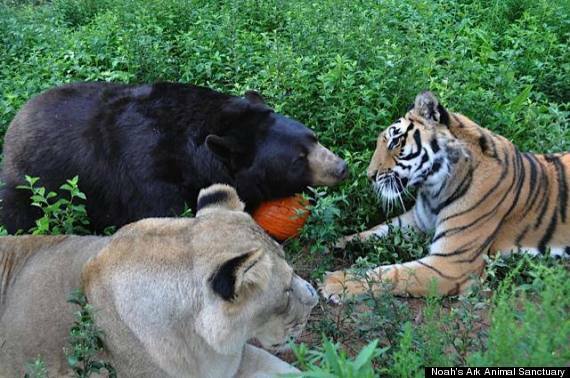 On Oct. 10, they had announced that Noah's Ark Animal Sanctuary had won. They even received an extra $10,000 for attracting the most unique visitors during the last week of the challenge. Additionally, they were able to raise $362,269 through crowd-funding. The installment company even agreed to discount the price of the new fence. And once more, all is right in the BLT-land.